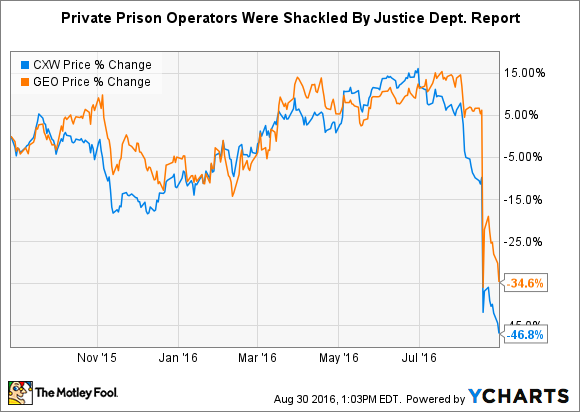 Private prison operators may have been dealt a hard body blow, but they'll remain standing. A flawed Department of Justice report may have caused private prison operators to lose some business, but federal prisoners comprise only a small percentage of the total prison population. Image source: Getty Images. Did the Department of Justice sign the death warrant for the country's private prison system? Although their days are not likely numbered, private prison operators Corrections Corp of America (NYSE:CXW) and GEO Group (NYSE:GEO) should still be very worried. The federal agency issued a memo last week instructing officials to either let contracts with private prison operators expire when they come up for renewal, or "substantially reduce" their scope. In either case, the intention is "ultimately ending...[the] use of privately operated prisons." On the surface, it may not seem like a big deal because federal prisons covered by the memo only account for 13 facilities housing 22,000 prisoners, but the ramifications stretch far beyond those prisons directly touched by the order. Because the memo followed an inspector general's report that slammed private prisons as being less safe and less secure than government-run facilities, it could very well cause other agencies to examine their relationships with private prison operators and open up others to lawsuits if they continue to use them. The stocks of the publicly traded prison operators took a hit on the news, with Corrections Corp and GEO Group initially getting cut in half before their shares closed the day down by a third. There's good reason these real estate investment trusts were whacked: Corrections Corp will see its contracts for 10,800 beds at its three facilities reduced to 3,600 beds, representing approximately $131.2 million in annual revenues, or some 7% of the total, while GEO Group has five prisons under contract with the Federal Bureau of Prisons representing 11,000 beds that account for 14% of its annual operating revenues. A contract extension that GEO had just been granted by the BOP was also quickly rescinded. A third prison operator, privately held Management & Training Corp, operates two facilities for the bureau. If all federal agencies that Corrections Corp or GEO Group contract with follow the DOJ's lead -- the memo, for example, doesn't cover immigration or the Marshal's service -- the effect could be devastating. The former says payments by federal correctional and detention authorities represented 51% of its total revenues in 2015 while the latter says 45% of its revenues are derived from federal customers. Private prisons have long been a touchstone for controversy as many people have a moral objection to private businesses keeping individuals locked up, but the financial benefits to federal, state, and local governments have been hard to argue with as private prisons tend to operate more efficiently. Yet the inspector general's report insinuated that comes at a cost. It found more incidents of assaults and contraband being confiscated and determined private prisons were less safe and less secure. But a subsequent Bloomberg report indicated the OIG's report was severely flawed as it did not account for what types of facilities private prisons were most used for or whether they had stricter policies than government-run prisons, which would lead to more contraband being found. Regardless, the wheels set in motion could lead other agencies to also review their contracts with an eye toward non-renewal. And agencies that didn't follow might become subject to lawsuits for putting prisoners in harm's way by allowing them to remain at these private facilities. The problem is that the prison system is already overcrowded. According to data from the Department of Justice, private prisons in 2013 housed 9% of the total inmate population at the federal and state level, or almost 142,000 of the total 1.57 million federal and state inmate population. The problem is the BOP's prisoner population is still bursting at the seams and remains 20% over capacity. Ending contracts with Corrections Corp, GEO Group, and Management & Training is only going to exacerbate the issue, and that means either more prisons will need to be built -- unlikely in this time of budget constraints -- or more prisoners will be released. Neither seems a workable solution and may be what keeps private prison contractors off life support.